As said Mazoola, Sunflow uses different types of light for a sky without texture (SunSkyLight) and a sky with texture (ImageBasedLight). Although they have a parameter that seems common, rendering for a sky with texture depends on the image used (example: blue sky or cloudy sky). Your plug-in is great but I encountered some issues. 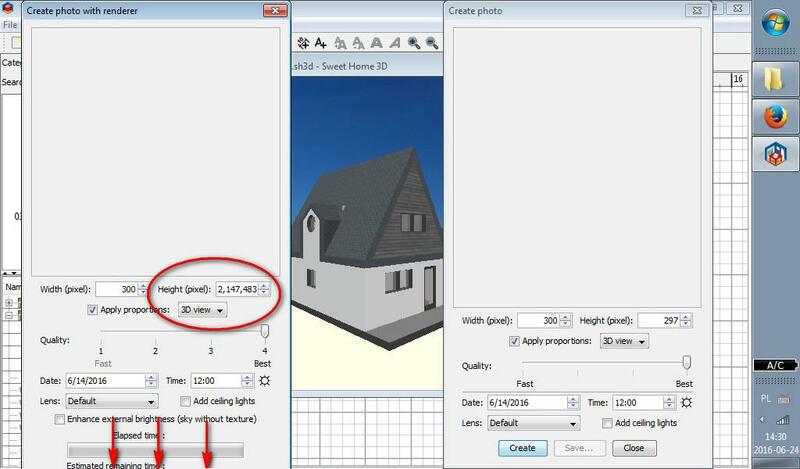 1) When "Apply proportions" is set to "3d view", changing image width to any value always makes height = 2,147,483,647; new height value makes width = 0. Switching back from "Square", "4/3" and other proportions presets (that work fine) also causes this unwanted effect. If I want my image to keep proportions of 3d view but I need to change size I have to do it via standard "Create photo" window. 2) "Create photo with renderer" window doesn't fit to my screen height(1024x600px) - I don't see "Create", "Save" and "Close" buttons, even if I move or hide task bar. I use Tab key but I have to carefully count hits to avoid accidental skipping "Save" button when I'm finally satisfied with my image. I would be grateful for fixing it. I can not reproduce it even by displaying the 3D view in a separate window. Is this occasional or systematic? Have others met the same kind of problem? 2) "Create photo with renderer" window doesn't fit to my screen height(1024x600px) - I don't see "Create", "Save" and "Close" buttons, even if I move or hide task bar. This will be fixed in the next version of the plugin that will be soon available. I can not reproduce it even by displaying the 3D view in a separate window. Is this occasional or systematic? - With 3D view docked (in main window) everything works fine. - When I open "CPwR" first and then detach 3D view - it also works fine. - Problem occurs every time I open "CPwR" when 3D view window is already floating(in my case - almost all the time). What I forgot to mention in my previous post - resizing this floating 3D view window manually(dragging edges) makes no changes to width and height fields in "CPwR". Apparently, only me and I have met this problem - it happens on my both laptops - WinXP and Win7(32-bit). By following your procedure, I was able to test the bug and find a solution. That's great! You're the man! In case of problems with previous links (unavailability of sourceforge), use the one attached. I had a lot of issues with the default render engine, especially the quality of the image (yes I disable ceiling lights and add lights myself) ..
Maybe I'm too harsh, I really like that you put effort into the rendering engine. Kudos for that! Don't get me wrong. But the future could be to switch to a better engine? Like from Blender perhaps. I really like Sweet Home 3D actually, but the render engine should get replaced by a more modern engine using GPU.